TheOvertunes was in Singapore recently as the opening act for local sensation, The Sam Willows and The Fifth Parlour had the opportunity to meet the brothers. 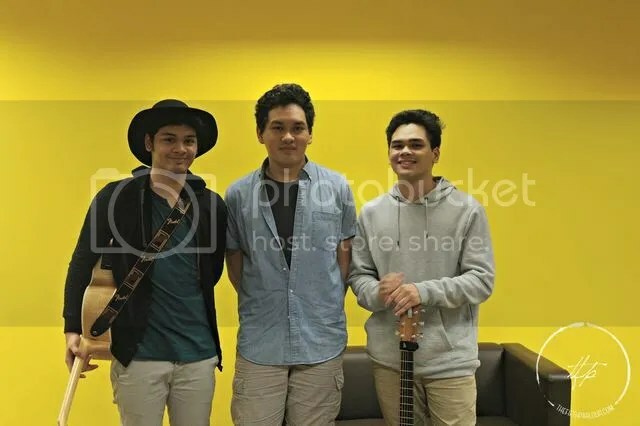 TheOvertunes is a band of singer-songwriter brothers consisting of Mada Emmanuelle, Reuben Nathaniel and Mikha Angelo. These talented brothers from Indonesia wrote most of the songs on their albums. So what is the inspiration behind the band’s name? The boys shared with us that they were jamming in the studio to Coldplay’s Fix You where they changed the key of the song, but could not reach the note so it ended up going out of tune. The boys also explained that there is no spacing in between the and overtunes because it looks more pleasing to the eyes. The band just released their first ever full English EP, Yours Forever. Out of the songs in the EP, the band recommended us listening to two songs; Yours Forever and Let You Go. The Fifth Parlour had the opportunity to listen to both songs live. It feels so nice to be serenaded by them. According to them, both songs have a modern twist to it and are close to heart. As of now, the boys are focused on their promotion for their new EP in the hopes to attract more fans. They are also working hard to reach their goal to perform beyond the borders of Asia where more people are exposed to their music! They also shared with us their excitement about opening for The Sam Willows and told us about their brief encounter with The Sam Willows backstage last year when they opened for The Script, and also mentioned how friendly The Sam Willows was. In case you missed out, TheOvertunes also recently covered For Love! It is no wonder that they were picked as one of the opening acts! Fans of The Overtunes will be pleased to know that the boys will be back in Singapore in September! Stay tuned with us for more updates about their upcoming visit. The Fifth Parlour would like to thank The Overtunes and Sony Music Singapore for the interview!